Classroom management is a topic of enduring concern for teachers, administrators, and the public. It consistently ranks as the first or second most serious educational problem in the eyes of the general public, and beginning teachers consistently rank it as their most pressing concern during their early teaching years. Management problems continue to be a major cause of teacher burnout and job dissatisfaction. Strangely, despite this enduring concern on the part of educators and the public, few researchers have chosen to focus on classroom management or to identify themselves with this critical field. *First, positive teacher-student relationships are seen as the very core of effective classroom management. *Second, classroom management is viewed as a social and moral curriculum. *Third, external reward and punishment strategies are not seen as optimal for promoting academic and social-emotional growth and self-regulated behavior. *Fourth, to create orderly, productive environments teachers must take into account student characteristics such as age, developmental level, race, ethnicity, cultural background, socioeconomic status, and ableness. 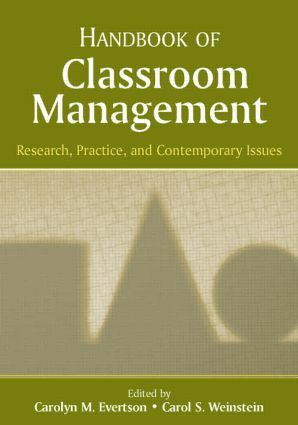 Like other research handbooks, the Handbook of Classroom Management provides an indispensable reference volume for scholars, teacher educators, in-service practitioners, and the academic libraries serving these audiences. It is also appropriate for graduate courses wholly or partly devoted to the study of classroom management. How Do Teachers Learn to be Effective Classroom Managers? Teacher Research and Classroom Management: What Questions Do Teachers Ask?